A hip roof may have the appearance of a pyramid. In a classic four-square hip roof, four hip beams convey loads from the roof peak to the corners of the exterior walls. 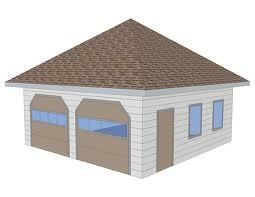 Hip roofs are structurally efficient because the hip rafters tend to act in compression rather than in bending. The shorter common rafters, which may be subject to significant bending stress, act to transmit load to the hip rafters. Problems of hip roofs include asymmetrical design, where loads are not balanced. In some cases, vertical supports have been wedged in and transmit an unduly large load to the attic floor. This can lead to structural problems on not only the attic floor but also lower floors. Where this type of problem exists, it is the structural engineer’s job to carefully analyze the load conditions and design reinforcing and/or restructuring that will direct loads to the exterior walls to whatever degree is possible.